Seriously, Where Should I Buy Granite Countertops in Dallas? 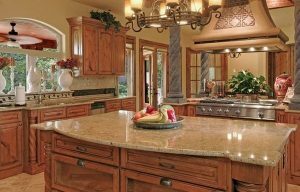 Once you decided to upgrade your kitchen or bathroom with new granite countertops Dallas, the next step is buying. This is where you need to decide where to buy granite countertops in Dallas. Whether you rely on referrals from friends or family, choose a company who sent you a flyer in the mail, or find a fabricator online, you will need to evaluate their trustworthiness and quality. At the end of the day, it is all about understanding the best option that allows you to save money and ensure quality. It holds true that home improvement stores indeed sell a variety of Dallas’ granite countertops. However, they are not really an ideal option – and this is due to a number of reasons. For starters, they do not have an array of selection flexible enough for you to find a countertop material that matches your kitchen or bathroom design. Add to this the fact that they usually sell countertops at very expensive rates. You will be surprised that the cost of buying is more than the actual installation, which is ridiculous so to speak. Also, home improvement stores do no offer cutting, edging, or even installation. Now, these among others are important processes in buying countertops in Dallas. You want to buy from a company that already gives you access to these processes. Unfortunately, with home improvement stores, they do not have such. Ah, this is definitely the most ideal way to buy granite in Dallas. Fabricators are those that, well, fabricate countertops themselves. There is no middle-man involved here. If you do business with, you are really doing business with them. This is why they can offer countertops at affordable rates, and they call this factory-direct price. And mind you, the countertops are so cheap that if you compare it with home improvement stores, the different is unfathomable. This one here though will still lead you to fabricators. That is because fabricators do not only sell countertops for kitchen or bathroom. They also offer a variety of tasks, such as edging, cutting, and even installation. And if you hire the same fabricator to get the job done, you are likely to get discounts, deals, and/or promos. Besides, these fabricators know the complexities in installing countertops, and thus are trained to get the job done. Want to know the best place to buy granite countertops in Dallas? Call us now at Hard Rock Imports. We certainly offer countertops at very affordable rates. Give us a call now!